This is how I as a caring and therapeutic parent talks to my child. I see that I want to demonstrate to my child that it’s okay for them (even desirable) to be in touch with their feelings. I wonder if I’m projecting my need onto them. I need to reverse the thought to “it’s okay for me as a mum to be in touch with MY OWN feelings”. Especially those feelings that get triggered by my child when they are in the throes of one negative emotional state or another. As adults, we all know these days about emotional intelligence and how successful people have high emotional IQ’s etc. etc. We are all busy going to therapists, counsellors or coaches to get ourselves in touch with our emotions. We see and FEEL great release from being able to express what we are feeling in the moment. 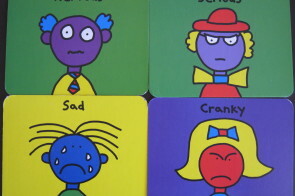 Yes, an emotionally intelligent child has been allowed to express all of her or her emotions fully. She hasn’t been told to stop crying, she hasn’t been talked out of feeling disappointed with another promise of something more exciting, she hasn’t been distracted from her grief by watching a movie or being given some food, hasn’t been made to feel humiliated or shamed because of the feelings she is having. Letting our children FEEL everything they feel, while we stay close or connected is how they start to make sense of these feelings. They EXPERIENCE them as temporary states, they get to know you love them no matter what and eventually when their frontal cortex is more developed they can start to put language and SPEAK to describe in words what they feel. Some brain research says this is as late as 9 or 10 years old. Thank you Kathy for expressing the difference between being allowed to “feel” the feelings versus trying to talk about the feelings. It is my experience that when we are allowed to feel everything we feel while a loving presence shines on us miracles occur! It is such a gift to love and be loved in this way.